Left Brain/Right Brain: An Outdated Notion? For decades, artists, arts educators, and other arts supporters have found the right-brain/left-brain notion useful in drawing distinctions between the creative and not-so-creative among us. Now, I am by no stretch of the imagination an expert on the anatomy and physiology of the brain, but I have to admit to never being very comfortable with this seemingly over-simplistic approach to describing the brain’s complex functioning. It always seemed to me that both hemispheres would, by necessity, function more harmoniously. 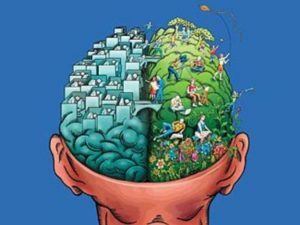 For the past several decades, the classic dichotomy of left-brain/right brain has reigned supreme in our notions of where creativity resides in the brain. But new research is methodically showing the right brain/left brain notion of hemispheric specialization to be over simplistic in its explanation of how the brain works. But throughout the 1990s, additional brain research was beginning to draw conclusions that broadened or further informed the left/brain/right brain theory. For example, it was becoming clear that in addition to both hemispheres working together, both halves of the limbic system also come into play. A “whole-brain” theory was being advanced. The right hemisphere of the brain is commonly considered the cradle of creativity. But several decades of studies suggest that’s an overly simplistic — dare we say unimaginative? — notion. It now seems clear the creative process is a product of intense interaction between the two hemispheres. In an August 2009 article, Tom Jacobs (Miller-McCune) discusses the findings of a team led by psychologist Elizabeth Shobe (Richard Stockton College, New Jersey), who examined whether an increase in inter-hemispheric interaction (i.e., the right and left hemispheres exchanging information) would enhance creativity. According to Jacobs, Shobe’s research (Influence of handedness and bilateral eye movements on creativity, ScienceDirect.com, August 2009) reached a couple interesting conclusions. First, that the more creative among us tend to be those without a strong or consistent hand preference, as opposed to those who are strong right- or left-handed. Second, at least in the short term, there appears to be a way to stimulate innovative thinking in those with limited imaginations. The research showed that “mixed-handers” scored higher than strong right- and left-handed people on each of five creativity scores (appropriateness, detail, categorical distinctiveness, fluency, and originality). Neurological studies dating back to the early 1990s suggest that individuals who strongly favor one hand over the other do not exhibit the same degrees of inter-hemispheric interaction as those with inconsistent hand preferences (e.g., ambidextrous). This supports the idea that creativity results from the intersection of left and right hemispheres (fixed rules meet a world of possibilities). “The right hemisphere of the brain is commonly considered the cradle of creativity. But several decades of studies suggest that’s an overly simplistic — dare we say unimaginative? — notion. It now seems clear the creative process is a product of intense interaction between the two hemispheres” said Jacobs. This entry was posted in Blog and tagged brain research, creative process, creativity, research, whole brain. Bookmark the permalink.